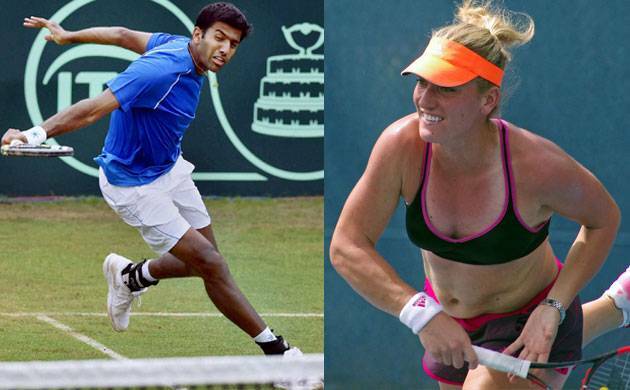 India's Rohan Bopanna and Timea Babos of Hungary entered the mixed doubles semifinals at the Australian Open with a straight-set win over Colombian Juan Sebastian Cabal and Abigail Spears of USA, here on Wednesday. The fifth seeded Indo-Hungarian pair took one hour and 15 minutes to get the better of Cabal-Spears duo 6-4 7-6 (5) in the quarterfinal duel. It was a hard-fought encounter as Bopanna and Babos had to dig deep to squeeze out the win. In fact, Cabal and Spears had the better break point conversion rate, utilising three out of the seven that came their way as against Bopanna and Babos' 4:12 record. But Bopanna and Babos kept a steady lead throughout the duel and managed to score more winners in both their first and second serves to eke out the victory. In the end the Indo-Hungarian duo won 73 points as against their rivals' 68. Bopanna and Babos will take on the winners of the other quarterfinal between Australian duo of Storm Sanders and Marc Polmans and Spanish-Brazilian combination of Maria Jose Martinez Sanchez and Marcelo Demoliner in the semifinals.